The building is on fire and people are jumping out of the windows to get to safety. As the rescue team, can you catch them all and return them safely to the ambulance? Move the rescue team left and right to position the life net under the evacuees. When they hit the net they will bounce back into the air. Carry them safely across the courtyard and to the waiting ambulance. Drop three evacuees and the game will end. You score 1 point for every evacuee returned to the ambulance. The speed increases as you play, and temporarily slows down every 100 points. The speed of the evacuees is fixed, but the number of evacuees on screen at any one time increases to 9. You score 1 point for every evacuee returned to the ambulance. This remake of Fire was given updated graphics and slightly tweaked gameplay to make it easier to score. Evacuees jump from the fourth floor of the building. You score 1 point for every evacuee you catch on the life net. Evacuees jump from the third and fourth floor of the building. 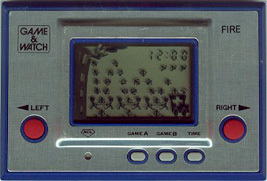 Due to a manufacturing error, a number of Silver series Fire games were released with the screen reversed. However, an actual copy of "Reverse Fire" has yet to be found by collectors, the information was officially given in Game & Watch Gallery 3.